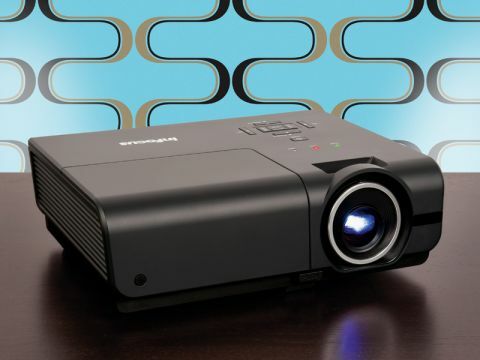 Can £800 really buy you a quality hi-def home cinema projector? Usually projectors that cost less than £800 are either aimed at the business/education markets or absolutely rubbish. And there can be no hiding place for shoddiness when you're watching a picture that's 100-inch wide or more. With this in mind, I was wary of the InFocus SP8600. But then scepticism changed to enthusiasm when I found out it uses a DarkChip 3 (DC3) chipset. This is a generation on from the DarkChip 2 system usually found in budget DLP PJs (such as the recently reviewed BenQ W1100), and typically delivers benefits over the DC2 in terms of colour response, noise levels and, especially, contrast. The other key part of the SP8600's optical system is a three-speed, six-segment (RYGCMB) colour wheel, which should help single-chip DLP's rainbow effect. Colours, meanwhile, ought to benefit from the inclusion of UNISHAPE lamp technology – here, the lamp continually adjusts its output to match the colour segment in play on the colour wheel. Meanwhile, the SP8600's connectivity includes a handy two HDMIs and a 12V trigger output. In short, there's really nothing on the SP8600's spec sheet that betrays its decidely cheap market position. Maybe its build quality is shoddy? It's certainly not the prettiest projector around, with some rather plasticky, gloss-free black bodywork. But it's small enough to store in a cupboard when not in use, and it's got sufficient curves not to look ugly when sat on a coffee table. The SP8600 backs up its usefulness in relatively 'rough and ready' environments by carrying a built-in speaker system, leaving an 1800 Lumens brightness output figure as the only thing concerning me on its spec sheet. A figure this high can be a good thing with a 'normal', more expensive projector. But the concern with a model as cheap as the SP8600 is that its brightness will overwhelm its contrast, leading to poor black levels. Setting up the machine reveals that it doesn't have any vertical optical image shift. This is entirely normal at the SP8600's price point, but I mention it because it means many people will have to use keystone correction to straighten the sides of their picture – a process which effectively results in distorting the source image a little. Optical zoom is limited, too, at just 1.2x, but the SP8600 does provide plenty of fine tuning options, including gamma controls and colour management. Power consumption increases to 275W with 'Boost' lamp mode activated. There's a minimal difference with movie footage – consumption stays the same regardless of content. In the default 'Bright' mode, we measured contrast at 2,100:1, with luminance at 36.4fL. Post calibration, contrast reduced to 1,200:1. 'Normal' picture mode gave the most accurate colour temperature. As hoped, the DC3 chipset helps the SP8600 perform ridiculously well for its money. Detail reproduction from the stellar Blu-ray of the Coen brothers' True Grit is superb, with, for instance, the textures in background wallpapers and every strand of the film's unfeasible amounts of facial hair being excellently rendered. The image's contrast is exceptional for a projector at this price point, too. The high brightness rating pushes whites and bright colours, as expected but, contrary to my fears, it doesn't stop black levels during dark scenes from looking reasonably believable and natural. There are plenty of £1,000-plus projectors that don't deliver dark scenes such as True Grit's nighttime shack shoot-out as convincingly as does the SP8600. Motion is handled well, with no severe motion blur or judder issues, and rainbow noise is only noticeable when very bright objects appear against very dark backgrounds. Which is to say, not very often. For the most part, other types of noise, such as dot crawl and grain, are decently suppressed. The only bizarre exception appeared during one of my favourite test scenes, the main card game in Casino Royale (the Daniel Craig version). During this sequence, the heavily filtered skin tones broke down into quite excessive blocking noise – a phenomenon I couldn't repeat with any other disc. And I tried a lot of 'em. There must be something about that Casino Royale colour tone specifically that upsets the SP8600. Thankfully for fans of the Bond movie, InFocus has developed a firmware fix you can download and apply to the projector yourself that can kick the noise into touch. Aside from the minor rainbowing and fixable noise issue, the only complaint I can level at the SP8600's pictures is that dark scenes look slightly hollow, thanks to a shortage of shadow detail. Cue a reminder of the SP8600's sub-£800 price – I expect issues like that at this price point. But I don't expect a performance so rewarding. The InFocus is therefore a home cinema bargain of quite ridiculous proportions. Get in!